As the oyster capital of California, Humboldt Bay’s bivalve business is big for the region, with a local economic impact of about $20 million in 2016, according to a survey conducted by Humboldt State University and California Sea Grant researchers. Humboldt Bay oysters have a major impact on the local economy. 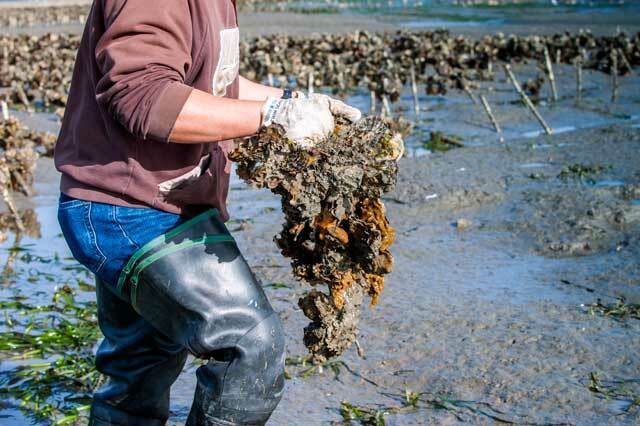 The survey of all six oyster businesses operating in Humboldt Bay provides a snapshot of mariculture’s socioeconomic impact and can help identify opportunities and potential challenges for the industry, researchers say. “The mariculture industry is undergoing changes, with some proposals to expand operations in the bay, so it’s important to understand the baseline when that’s happening,” says Environmental Science & Management Professor Laurie Richmond. She created and administered the survey along with Economics Professor Will Fisher, former Economics Professor Steve Hackett, student Wyatt Smith, and California Sea Grant Extension scientist Joe Tyburczy. The second-largest coastal estuary in California, Humboldt Bay is the largest producer of oysters in the state. Despite the industry’s prominence, Richmond and her team found that existing data on the socioeconomic conditions of the local mariculture industry was outdated and incomplete. So in 2017, they administered a survey that asked Coast Seafoods, North Bay Shellfish, Hog Island Oyster Co., Aqua Rodeo Farms, Taylor Mariculture LLC, and Humboldt Bay Oyster Co. about everything from their revenue to the number of employees to concerns and predictions about the industry’s future. Results, which focused on 2016 and were released in November 2018, revealed that while mariculture isn’t as dominant as the local commercial fishing industry, it remains a significant player in Humboldt’s seafood economy. The local oyster business was a $9.8 million industry in 2016. When the researchers calculated the indirect impacts of the industry, that figure translates into an estimated total local economic impact of $19.3 million, according to the report. That same year, Humboldt Bay produced 9.9 million market-size whole oysters, which generated most of its sales. Sixty-two percent of industry revenue came from the sale of whole Kumamoto oysters and 3 percent from Pacific oysters. Oyster seed made up 34 percent of total sales and was the industry’s largest expense, costing $4.2 of $10 million in total expenditures for 2016 — figures that surprised Richmond. “When people think of the oyster business they picture whole oysters. So it’s interesting to understand how something as small as seed and larvae has a huge financial impact,” she says. — The smaller Humboldt Bay oyster businesses (North Bay Shellfish, Humboldt Bay Oyster Co., and Aqua-Rodeo Farms) sell the majority of their oysters in Humboldt County. — The industry provides roughly 100 full-time jobs and plans to expand employment in the next five years. — The mariculture industry is active in the community, spending 267 employee hours a month collaborating or engaging with the community in graduate student research projects or other HSU activities, eelgrass and black brant studies, beach clean-ups, farm-to-table initiatives, and more. — Top concerns include the availability of tidelands (or access to areas in the bay where they can grow mature oysters), permitting costs, water quality, and regulatory changes. — Businesses anticipate higher production of oysters, larvae, and seed, and more acreage, jobs, and revenue by 2022. Much of this projected increase is linked to the approval of the Humboldt Bay Harbor District’s pre-permitting project, which could open up more grounds for mature shellfish production.